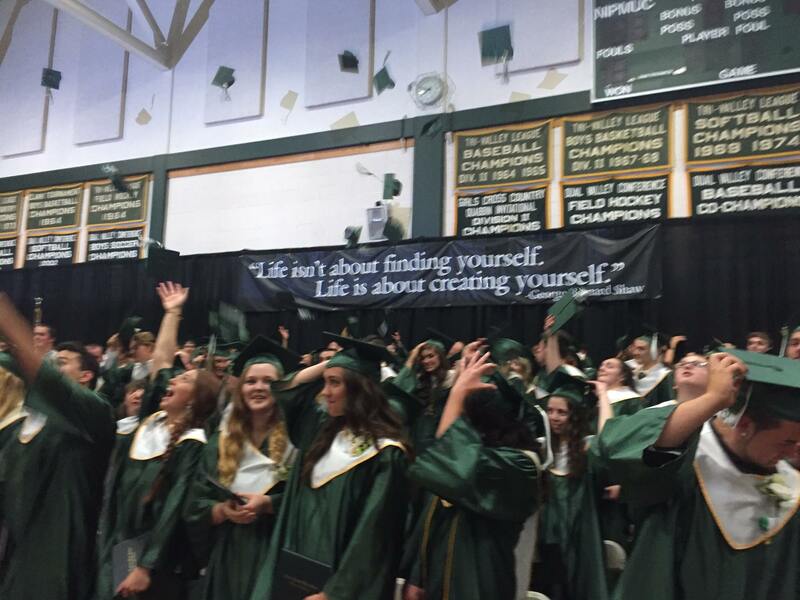 Surrounded by loved ones and friends, Nipmuc Regional High School’s graduating class of 2016 were encouraged to pursue their dreams and create a great life story at the Fifty-sixth Annual Commencement Ceremony held this weekend. “Whatever you dream, don’t lose sight of it. Engrave that vision in your head. Use that vision to push through the ups and downs,” Class President Christopher Bechara told his fellow graduates. “Never let go of your dream. I know you can do it. I love you all,” he said. Throughout the ceremony, held in the high school gymnasium on Friday, June 3, 2016, students and guests listened to stories of friendship, perseverance, volunteerism, and success. The class motto, “Life isn’t about finding yourself. Life is about creating yourself” – George Bernard Shaw, was woven throughout the ceremony. “Tonight I am grateful to have all of us together to look back on all that has led to the achievement of this great group of students and to celebrate the great things to come, and celebrate we will,” said Principal John Clements. Clements said the class of 2016 is filled with stories of hope, service, perseverance, volunteerism, and service. Stories of entrepreneurs, artists, actors. Stories of achievement and pride. “On this stage, beside us, are 160 students who have acted as lead characters…who are ready for the next scene,” he said. “Today we replay the movie of the last four years, from the long journey from kindergarten to adulthood. Today we watch that collection of memories, looking at individuals who have emerged as stars in their own stories… Theirs is a story that inspires us,” Clements said. To the graduates, “I urge you to find your story, to offer gratitude to those who have played roles in your lives or offered you direction. A remind you not to forget about the spaces between the scenes. To take the time to reflect on your growth, to celebrate your accomplishments, to capture the significance of your moments,” said Clements. District Superintendent Joseph Maruszczak advised the class of 2016 they will be entering a world which is constantly changing. “Forty percent of you will work in jobs that at the present time do not exist today,” he said. Maruszczak said the skills needed to succeed in a world of constant change are timeless. He advised the graduates to never stop reading, to continue to work hard, and to connect with people in a meaningful way. “Hard work and perseverance will be the biggest determinant for your success,” he said. Maruszczak encouraged the graduates to establish time to unplug from technology and build real relationships with real people. “Face to face interaction is a key factor in what makes people successful… Jobs may change but the heart of the matter is relationships count,” he said. The Nipmuc Regional High School Band performed Ere the World Began to Be and the Chorus performed Go the Distance. Senior Karley Collins gave a beautiful vocal performance of Dream. Seniors Bobby Johnson, Tyler Walsh, Jack Ernst, and Izaiah Wadsworth received a standing ovation when Clements highlighted their dedication to service; all have enlisted in the armed services. Sarah Tong was recognized as the class of 2016 Valedictorian and Stephanie Poly the Salutatorian. The graduating class earned 2.9 million dollars in scholarships. Some graduates will be attending universities close to home – Northeastern University, Boston College, Boston University… others will travel to New York University in New York, Purdue University in Indiana, James Madison University in Virginia, C0lumbia College Hollywood in California…. Click on any photo to enlarge and begin slideshow.